HomeNewsCyclists! See how an HGV driver sees you! Join us at our FREE safety event tomorrow at QEHB! Birmingham brain injury experts are offering city cyclists the unique opportunity to see what a heavy goods vehicle driver can and can’t see on the road. Tomorrow (Tuesday 24th March) between 9am and 2pm at the Queen Elizabeth Hospital Birmingham (QEHB), consultant neurosurgeon Professor Tony Belli and his colleagues in the trauma research team will be running a free drop-in event; ‘Take care, be aware’. 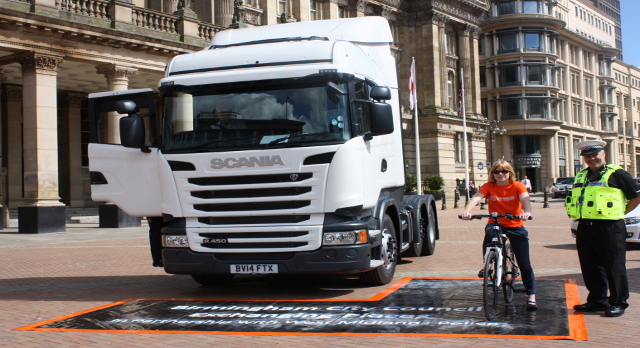 At the event, which has been organised in partnership with Birmingham City Council and West Midlands Police, cyclists will be encouraged to sit in the driver’s seat of a lorry. There they will be briefed by PC Mark Hodson about the dangers of cycling near to an HGV and made aware of the blind spots. There will also be free cycling goodies up for grabs* and the chance to talk to cycling experts and pick up top safety and bike maintenance tips. Professor Belli, Director of the National Institute for Health Research Surgical Reconstruction and Microbiology Research Centre (NIHR SRMRC), said: “Every death and injury on our roads is one too many. “Here at QEHB we’ve treated almost 100 cyclists and 244 pedestrians in incidents with other road users in the last three years and nationwide a fifth of cycling fatalities are due to a collision with an HGV. “We’ve organised ‘Take care, be aware’, our second event in the Science of Trauma: Outcomes and Prevention (STOP) series, to highlight the importance of cyclist, driver and pedestrian awareness of each other. PC Mark Hodson, from West Midlands Police Operations Traffic, added: “Educational events such as this are an excellent way for the West Midlands Police Safer Cycling Team, in conjunction with our partnership agencies, to reinforce the “share the roads” message. Anne Shaw, Head of Transportation Services at Birmingham City Council, said: ‘The City Council published Birmingham Connec,t its long term transport vision, last year and our aim is to support more people to undertake more active lifestyles. “A key part of this is encouraging people to walk and cycle more. In order to encourage active travel, addressing Road Safety is essential. “A common factor in people choosing to drive short distances, particularly for school journeys, is the perception of a lack of safety and security when walking, cycling and crossing busy roads. To find out more about the work of the trauma research team please visit www.srmrc.nihr.ac.uk. To show your support for the campaign please tweet using #TakeCareBeAware. Drivers: Did you know that cyclists are allowed and encouraged to cycle in the middle of the lane to prevent you from overtaking in dangerous places or that you should give cyclists as much road space when overtaking as a car? Cyclists: Did you know that it’s illegal to cycle in public under the influence of drink or drugs or that pedestrians have priority on canal tow paths? Pedestrians: Did you know that vehicles do not need to stop until a pedestrian is on a zebra crossing or that cyclists do not legally have to have a bell fitted? Pictured is the HGV cab in Birmingham City Centre.